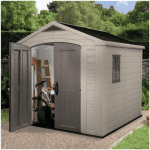 This Duramax Woodbridge shed makes use of a sturdy steel frame, coupled with robust vinyl plastic cladding for the panels, so as to ensure that the unit is strong and durable. 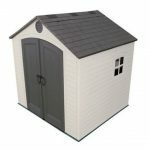 Furthermore, the fire retardant and weather resistant properties of this plastic shed help to keep it safe, whilst requiring little to no maintenance. 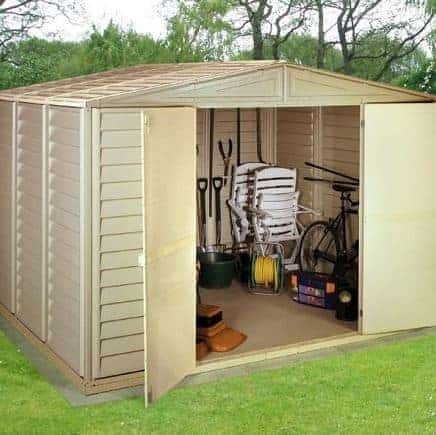 At 10’ x 10’, this plastic shed is best suited for larger gardens, and can be used for the storage of tools and gardening equipment, as well as bicycles, garden furniture and much more – all of which is easily reached through the double doors at the front of the shed. 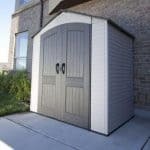 Hi Kenny, with this particular metal shed it is recommended that you do lay a solid foundation. 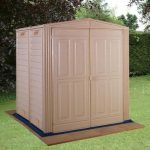 If you would like to see how to do that please look at our how to lay a shed foundation guide. 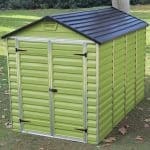 For this particular metal shed we recommend you buy it from Sheds.co.uk. 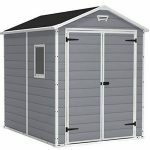 At this point in time they are offering free delivery to Manchester but you will need to wait 15 to 20 days for delivery.